Welcome to the 2007 Gallery archive. Here you will find the limited edition, numbered stained glass trees created for the year as well as custom design pieces. 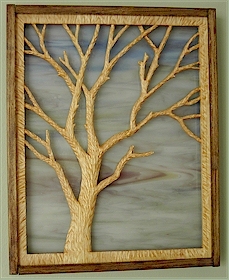 This tree was hand carved from soft maple and features several knots in the design. The hand-rubbed oil gives it a rich honey color and the semi-gloss lacquer finish highlights the bark carving detail. The stained glass has waves of deep orange highlighted by soft yellows and white, with a hint of blue in the sky area. The frame is stained dark walnut. This tree was hand carved from birch and outlines a face in the design. The hand-rubbed oil gives it a light honey color and the semi-gloss lacquer finish highlights the bark carving detail. The stained glass has waves of blue and white highlighted by red, yellow and orange. The frame is stained dark walnut. 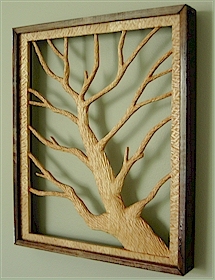 This tree was hand carved from soft maple and features several knots in the design. The hand-rubbed oil gives it a rich honey color and the semi-gloss lacquer finish highlights the bark carving detail. The stained glass is butter yellow with waves of dark yellow and bits of orange highlighted by soft white. The frame is stained dark walnut. It stands on walnut stained feet, which can be removed for wall mounting. The full piece is roughly 9 x 11 inches. This tree was hand carved from light birch which sits in dramatic contrast to the rich, deep red and orange glass. Watch how it changes color from day to night and the warm backlight effect. The frame is stained dark walnut. The full piece is roughly 9 x 11 inches. This tree was hand carved from birch and features an open back design. The shadows cast on the wall add another element of depth to the work. The frame is stained dark walnut. This tree was custom designed in 2005 as a special birthday gift for the person who’s face is in the moon. The Heartwood Art logo is also taken from this design, making it a signature tree. It also serves as the basis of the Knotty Tree design above. This carving was featured in the 2009 Summer edition of Woodcarving Illustrated.